By 10 a.m. Wednesday, 40 people were camping outside the Chick-fil-A location at 4600 Roosevelt Blvd. that won't officially open until 6 a.m. Thursday. The most unique thing (sans cow) about closed-on-Sundays chicken fast-food chain Chick-fil-A is the campout tradition. For the opening of every new location, the first 100 customers get a year's supply of meals; more accurately, they get a card that entitles them to 52 No. 1 chicken sandwich combo meals. In order to snag the deal, people camp out in the parking lot a day in advance. 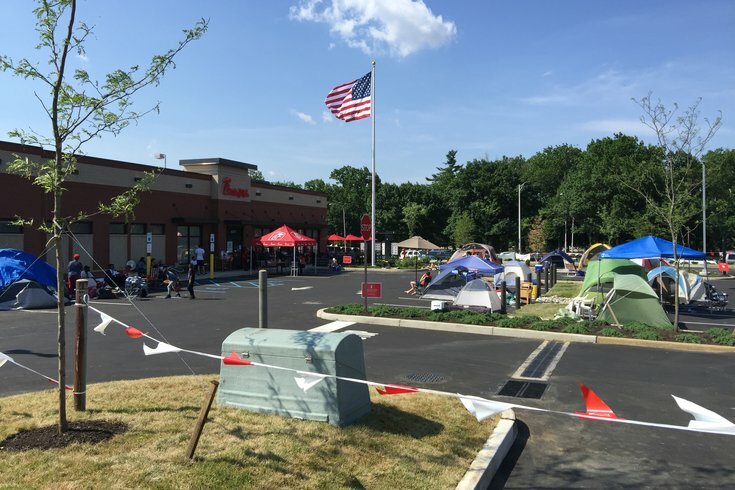 PhillyVoice's Brian Hickey went to the opening of a Chick-fil-A in Northeast Philly last summer to witness the phenomenon. Among the Chick-fil-A fanatics he met: one woman who had been on 54 trips to grand openings and a Bucks County resident who invoked the Bible when describing his appreciation for the chain and the Community First 100 deal. Despite the rabid love for the tradition, a new location opening at 45 W. Street Road in Warminster, Bucks County, will be doing things a little differently in an effort to give back to the community. In lieu of camping overnight in a Chick-fil-A parking lot, up to the First 100 participants at the Warminster location, starting at 6 a.m. on Wednesday, April 5, will depart mid-morning and travel around Warminster on chartered buses. They will spend approximately six hours engaged in activities of community service at stops along the way. Upon completion of the road trip, each eligible participant will return to the Warminster restaurant at around 3 p.m. to continue the celebration. The post-road trip party will include dinner and the awarding of the one-year supply of free Chick-fil-A meals. The altered version of the 13-year tradition happening at the Warminster location is available only to those 18 and older. If more than 100 people are in line at 6 a.m., a random drawing will be held.